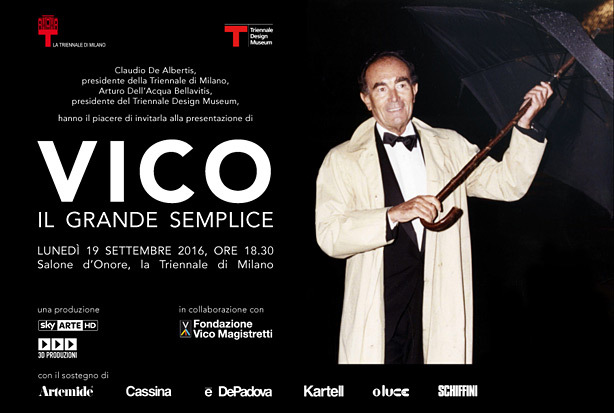 Exactly ten years after the passing of Vico Magistretti – on 19 September 2006 – the Triennale of Milan and the Triennale Design Museum will pay tribute to the designer and architect by presenting a preview of the documentary “Vico: il grande semplice”, a Sky Arte HD production made with the collaboration of the Magistretti Foundation. Indeed, the documentary Antonio Verderi (President of Oluce) talks about the 20 plus years of friendship and work shared with Vico, designer, architect, Art Director of Oluce and creator of some of the company’s best-known and most popular lamps. The documentary will be broadcast on Sky Arte HD on Monday 19 September 2016 at 9.15pm.